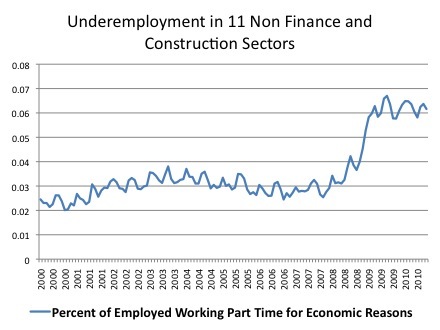 The Stagnating Labor Market, 2: What Can the Employed Tell Us About the Unemployed? Arjun Jayadev and I have another working paper out of Roosevelt Institute, this time focusing on the labor market in the current recession. The paper is: The Stagnating Labor Market (pdf). I hope you check it out; I’m going to talk about the main things we found in two posts. In order to examine this question we will now look at those who are underemployed. Specifically, we will take into account those who work part-time for economic reasons, whom the Bureau of Labor Statistics record as employed. These values are at historical highs, especially for “Slack Work of Business Conditions” which has leveled off to a steady state not seen except for a blip in the late 1950s. The percentage of the labor force working part-time for economic reasons is among the highest values in over 50 years. We focus on studying unemployment by only looking at the employed for two reasons. The first is that this removes the “skill” story from the picture; these employees have the skills necessary to work the first hour of their job but there just isn’t enough demand to work the 35th hour of their job. It is a curious firm that can hire someone whose skills allow them to work the 10th, 20th or 30th hour of a job profitably but not the 35th hour. The second is that it also removes any potential work disincentives created by unemployment insurance. The debate about the effects of unemployment insurance on the unemployed is a very controversial one. Some have claimed that the increase in unemployment is largely a result of extending unemployment insurance. Others have argued that the negative effects of unemployment insurance have been largely overstated and that unemployment benefits provide a very effective form of stimulus spending. This debate is not relevant to those working part-time for economic reasons. The number has approximately doubled since the financial crisis and recession, and has plateaued into a new, higher, steady state. Could this be a skills story, as these workers can’t be retrained? The pattern is almost identical. There’s been a recent series of influential papers that argue that structural unemployment doesn’t happen at the sector level but instead at the occupational level. Workers, after all, don’t work sectors; they work occupations. One can be a maintenance worker or an accountant for a manufacturing firm or for a high-tech start up. 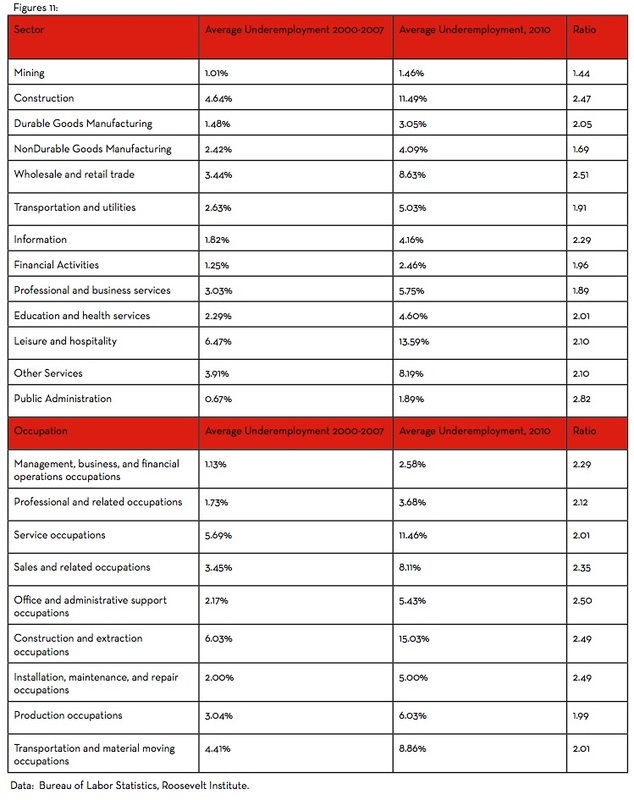 If the demand for skills moves between maintenance workers and accountants, you could see problems in all sectors, even though it’s still a change in the demand for occupational specific human capital. Looking at this too we see the same exact pattern: every one of the nine occupations we obtained data on had a doubling, at least, of underemployment. Services employees are twice as likely to be working part-time for economic reasons as they were before the recession began, for instance. Everywhere we look, across occupations and sectors, people with the skills to work their jobs are more likely to be working part-time for economic reasons in 2010 than they were before the recession. This is a story of aggregate demand, not a story of skills mismatch. In light of the political climate and the impending elections, government officials may be loath to address this problem frontally. Such an approach, while politically expedient may be disastrous for the economy and for social welfare. If the issues of long term unemployment and the large number of people dropping out of the labor force are not addressed soon then what is an aggregate demand problem can become a structural problem through hysteresis effects. Officials need to act in a bold and imaginative manner to repair the labor markets dysfunctions-much as Roosevelt did-or risk entrenching the social misery that engulfs many Americans today. 21 Responses to The Stagnating Labor Market, 2: What Can the Employed Tell Us About the Unemployed? As a country, we’ve been _not_ dealing with global wage arbitrage and currency manipulation for decades. It seems you’re advocating that instead of dealing with the underlying structural problems we simply goose AD via government debt? How long will that solution last? (and why) Honest question. I notice you’re referring to people who were making (perhaps substantially) more than the median family income, and you seem to be saying that they could be employed if they were willing to accept salaries of no more than the medial family income. Since you state you are in a position to hire people, I have to suppose you are better informed about that aspect than I am, but I’m thinking about the anecdote last week about the people who were written up in one of the national newspapers. WSJ? Anyway, they claimed that they offered work and were unable to find people with the necessary skills willing to work for the wages they were offering. A factor that was not widely reported about the story was that they were offering wages that were substantially less than had been normal pre-2008, they were offering wages that were substantially below what is being paid in other companies for similar jobs. Now. Not slightly less, substantially less. I think the salary offered for skilled welders worked out to about $26,000 a year. It’s a vexing question, because we don’t usually hear all the details in these anecdotes, only the point the teller wants to make. My experience has been that there have been two times in my professional career (20yrs) where salaries were “not real”. Both of those were during credit bubbles – the tech bubble and the housing bubble. After the tech bubble, it took a couple years (I think, it’s been a while.) for expectations to adjust back to reality. Salaries of software devs and project managers came down during that adjustment period. It seemed reasonable to me and certainly not painful as we all were making more than most Americans. Software is a strange industry. Top developers are substantially more valuable than average developers. Not 50% more, but like 5x. If a person is an average developer, they are more often competing with overseas labor. If a person is a superstar, they have their pick, still. Most often, I’m looking to hire stars since the management overhead for them is less and that is where I’m most often constrained. Sometimes I have small projects where I can hire a more average developer – usually because it is a not-so-complex problem. And this is where wage deflation is happening the most. The reason is because increasingly I can purchase these services from anywhere in the world. I’ve utilized Elance to have development done by a programmer in India. He’s about 5x less expensive than if I had contracted this work out to a local developer. That difference is difficult for me to ignore. Before anyone claims I’m greedy, keep in mind that sales from one of my businesses (web SaaS) have declined roughly 50% over the past 3 years. I’m not wealthy, just a middle class guy trying to keep from working for the man. My overall point is this. If we goose AD in the short term, to what end? To get salaries back to bubble levels so people will take those jobs? How long does that last? Sure, if we boost AD unemployment will go down. For how long? What is the next step? Does wage deflation due to global forces simply stop? How long can we ignore gravity? It seems from basic economics that if wages were not sticky, most people could find employment and our economy would be on a better trajectory. Why is that solution not offered as well? So if I understand correctly you are saying that even though you are hiring in this economy, you don’t want to help out your own friends who work in your industry. I’m sure you could work something out with the salaries. Maybe they could mow your lawn or something to close the gap. “Those people”…man that’s cold. I’m hiring with constraints. I _do_ want to help people who work in my industry. I’ve consulted with several of them to help convince them of the reality of the situation. It is difficult. Imagine if you were making $75k for several years and now a friend of yours says he’d hire you, but you need to work for $40k. That would be a tough pill for most to swallow, but it is the cold hard reality of the situation. I’d rather my friends worked and kept their skills up to date making $40k than sat idle waiting for that magical $75k job to reappear. Because it is most likely it never will, those salaries were fake, much like our overall economy was during this last credit bubble. If they work now for less, they have a better chance of moving into a higher paying job than they do sitting idle. I know I sound cold, but it’s a “tough love” approach. I’d rather that people understand reality than tell them continually that things will be OK and “daddy” will take care of them. Daddy (govt) can’t and won’t b/c he’s busy giving money to corporate interests through these “stimulus” spending bills. If I understand this analysis correctly, as some sectors improve and are able to fully able to employ all who seek full employment, then, cyclical employment would become structural employment. This analysis therefore seems to be misleading. A million carpenters in California could be out of work with a million job openings in New York but this is not ‘structural unemployment’ if there is rise in underemployment across all sectors, with no regard for large differences in amounts of underemployment. Such a criteria would thereby almost guarantee that all severe downturns are categorized as ‘cyclical’. Are your graphs mislabeled? 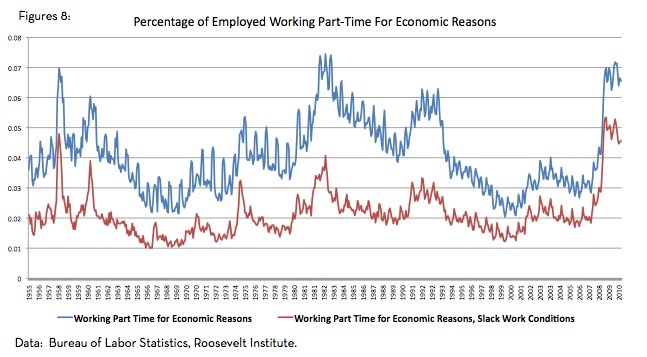 0.05% of people working part time for economic reasons seems really low, but 0.05*people or 5% would be reasonable. Yes. .05 is meant to be 5%. I should just have .05 without the word percent or 5%. I’ll change that (and add recession bars!) to the next version. I am only tying to understand the distinction between ‘structural’ and ‘cyclical’ unemployment. Because my first comment remains unanswered, I shall try a different tact: Using the chart above (fig. 11), what if in the first category, (‘Mining’), the 2010 number were 1.00% instead of the number of 1.46% as listed. 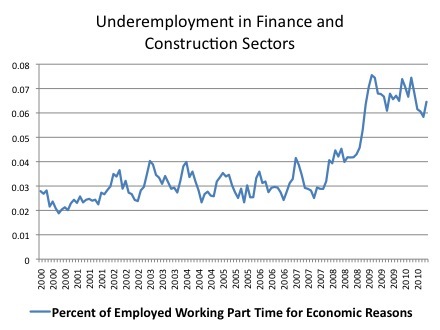 Now, with the 2000 -2007 number of 1.01% being higher than the hypothetical number of 1.00% underemployment is no longer “rising in every sector”. So, does this then mean that by your criteria, as presented above, that cyclical unemployment and structural unemployment are simply two separate phases of the same circumstances? If so, one of us is confused about the meaning of the term; ‘structural unemployment’. At the risk of being trite, your analysis would seem to always lead to the conclusion that severe downturns are always cyclical while mild downturns are always structural. Ben Stein thinks it’s because the first to be laid off and the last hired are those with bad tempers and personality problems, and he presumes there are more of such types today. He may well be very wrong. But even if he is right as to individuals, he forgets about the fallacy of composition, and of course that old Keynesian work horse – rigid wages. Perhaps there is a further nuance: the transactions costs in the labor market rise during recessions where there is a skills-mismatch problem. The effect of the financial bubble on the residential housing industry extends to the workforce that built the McMansions. The bubble supported many more jobs for carpenters, plumbers, electricians and other craftsmen than today’s market for new housing. A large portion of the residential housing industry workforce is now working on remodeling and improving existing homes. But a substantial portion of the workforce remains unemployed and underemployed. Their bubble-based jobs are gone and those jobs aren’t coming back. If the craftsmen formerly employed and those now underemployed in the residential housing industry want to work, they will have to find employment in other industries. Most of those finding employment in other industries will have to learn new skills to be competitive. This surely fits the notion of “structural” unemployment. Health care. Health care. Health care. What costs $15,000/employee for hour #1, but not at all for a contractor? The cost of the employment relationship is too high in the United States. It’s all about health care. Look at auto industry factory utilization in Canada versus the US. High unemployment is a sign of another problem. Canada, the United States and the entire world is overpopulated. There are just too many people. A good long term solution is to have fewer kids now; the effects from thar will be more job opportunities two or three decades from now.